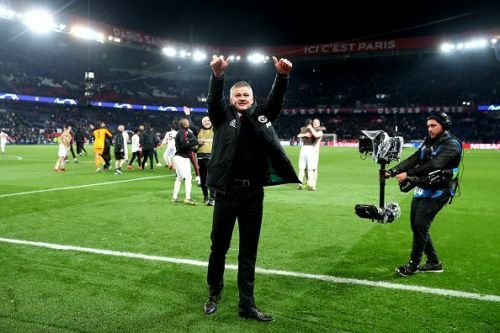 After a dramatic 3-1 win against Paris Saint-Germain, Ole Gunnar Solskjaer believes that his team can go all the way and win the Champions League this season. After a disappointing 2-0 loss in the first leg of Champions League Round of 16 tie against PSG at Old Trafford, Manchester United pulled off an outstanding 3-1 (3-3 aggregate) victory in the second leg, qualifying for the quarter-finals through the away goals system. The Red Devils have been unstoppable since the arrival of Solskjaer in December and are yet to lose a league game under his guidance. They are currently fourth place in the Premier League table and are in a strong position to finish in the 'top four' this season. United interim manager Solskjaer believes that his team is capable of winning the Champions League this season. "Of course we fancy ourselves, "We can go all the way, but we just have to wait for the draw and take each game as it comes. The Norwegian also reveals that he is planning future with the club. Manchester United will play Arsenal in the league before squaring up against Wolverhampton Wanderers for the quarter-finals of the FA Cup on March 17.